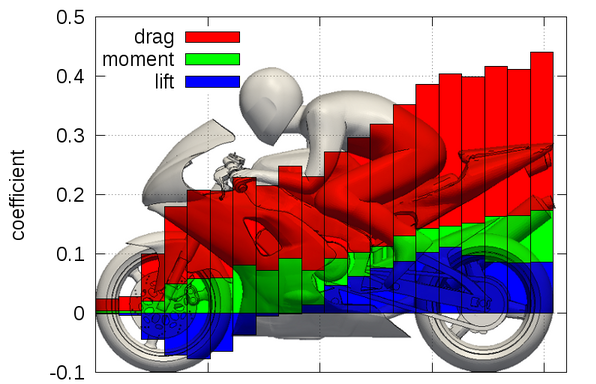 OpenFOAM can carry out post-processing automatically while the simulation is running using function objects. In v2.2.0, the range of available functionality has been extended to include the following. All function object data is now output to a postProcessing directory in the case directory. new wallShearStress – calculates the wall shear stress for incompressible and compressible cases. new pressureTools – enables the calculation of pressure (from kinematic pressure), total pressure, pressure coefficient and total pressure coefficient. new CourantNo – calculates the Courant number. 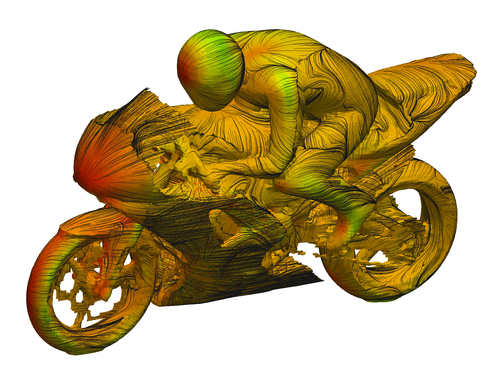 new DESModelRegions – calculates a scalar field for use with DES turbulence models, to indicate the regions specified by RAS and LES regions, respectively. updated faceSource – when employing the valueOutput option, values can now be written in formats such as VTK, as opposed to raw data values. new fieldValueDelta – enables operations including addition, subtraction, minimum and maximum to be applied to faceSource and cellSource function objects, e.g. to calculate the flux imbalance across inlets and outlets. new yPlusRAS and yPlusLES – calculates yPlus for incompressible and compressible cases, employing RAS and LES turbulence, respectively. new Lambda2, Peclet, Q – calculates flow fields for Lambda2, Peclet, and Q.
updated fieldMinMax – updated to include the locations of minimum and maximum values. new processorField – writes a scalar field of the local processor index. turbulenceFields – stores turbulence fields e.g. R, devRhoEff, muEff. new cloudInfo – outputs Lagrangian cloud information to a file. The current outputs include total current number of parcels and total current mass of parcels. new calcFvcDiv – calculates the divergence of a field, and stores the result on the mesh database for further post-processing. new calcFvcGrad – calculates the gradient of a field, and stores the result on the mesh database for further post-processing. new calcMag – calculates the magnitude of a field, and stores the result on the mesh database for further post-processing. Version 2.2.0 includes the following new post-processing capabilities. The set of available surface data writers has been extended to include a nastranCSE writer.